If you are holding your Wedding in the Fall, then here are some great Pumpkin ideas to incorporate in your Reception to bring out the Fall Season! 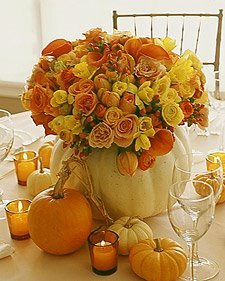 Decorate your Wedding Venue and Reception Area with Pumpkins and Gourdes. Not only are the Pumpkins plentiful during the fall season, they are an inexpensive decorating option – great for those on a tighter Wedding budget. Pumpkins also come in all different shapes and colors versatile giving you many options for colors and design. At the end of the Wedding Reception, it’s also a fun and unique idea to give the Pumpkins to your Guests for them to enjoy cooking or decorating with at home! 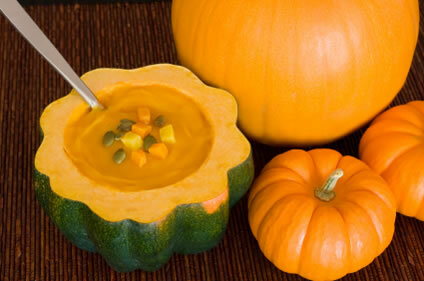 Taking the Pumpkin theme one step further, if you are serving a soup at your Wedding Reception, then consider Pumpkin or Squash Soup in a Pumpkin Bowl. This is truly a delicious and eye-catching idea! Previous post: Keeping Children Entertained! Next post: Ideas to Reduce Your Wedding Catering Bill!